Parrot Mambo Drone Review 2019 – is the Parrot Mambo quadcopter worth the money? Review of features, pricing, flight duration, battery, camera and more. Parrot Mambo has been a popular entry-level drone ever since the introduction of the first model in the Mambo series which was the Parrot Mambo Fly. 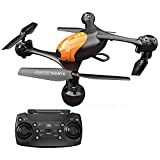 This was a cool enough drone, was available at an easy price and was a good choice for novices in the drone world. You could hone your flying skills with a model like this one and maybe upgrade to more inexpensive products later on. The Fly model was suitable for children, too. Then came the Mambo Mission that introduced and popularized the use of grabber and cannons while flying a drone. The model was equipped with more sophisticated features and as you can expect, the price went up a good few notches. But the latest in the Parrot Mambo line is the Mambo FPV. This model is more in sync with the common expectations of the average flyers—high definition shooting, FPV camera, ability to share live feeds on platforms such as Youtube, facebook, etc. Subsequently, the FPV model has able to garner more popularity compared to its siblings. And accordingly, we’ll also concentrate on this model in our present review. The first thing a buyer of Mambo FPV must keep in mind is that, unlike the Mambo Fly, this is not quite a child’s toy. In other words, if you are planning to gift your son a quadcopter on his 10th birthday, you should choose the Fly model and not the FPV one. We mention this separately since all of these models come with the name Parrot Mambo, it is easy to get confused sometimes. In fact, in the Instructions Manual of the FPV model, the first item on the ‘Warning’ page puts it categorically that this is ‘NOT A TOY’ and that children under 14 years of age should not handle this machine. Well, that out of the way let’s jump into all the cool things that Mambo FPV has in offer for you. Pretty much everything you need to fly the machine. So, there is the quadcopter, of course; the Flypad controller (which also includes a smartphone holder so you can get FPV from the controller itself); the cockpit glasses with a headstrap—the real FPV gear; FPV camera smart block; propeller guards; one battery plus a USB cable charger. What you don’t get: It would’ve been nice to have two batteries for a drone of this price range; smart block objects, such as cannons or projectiles, etc. (you need to buy them separately). As you can already gauge from the aforementioned dimensions, the copter is rather a small one but with a nice looking white chassis made of plastic. There are two green Led lights placed at the front of the chassis and these give the machine a somewhat bug like appearance. The limbs and the rotor blades are made of plastic, too. However, for all that, the unit is quite sturdy and durable, although we would still recommend that you use those prop guards at least for the first few times you are flying the machine. However, the price tag that the unit comes with is really owing to all the technology that it packs within its tiny body. What the flyers would enjoy most is the drone’s intuitive flying and its ease of use. For example, once it is launched already and is flying, you can take your hands off all the control and it would still keep hovering on a fixed altitude (yes, and the funny part is that the ‘altitude hold’ feature works even when you have put it on the off mode!). Again, you don’t need to keep the controller focused all the time at the direction you want the drone to go. 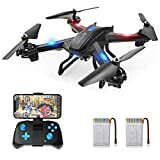 In fact, you can keep your hands off altogether and as long as you are giving it a little bit of gas (using the controller), the drone will hold its position pretty fine and not veer out of control or crash on its back or anything. Also, the drone offers three separate flying modes. The hands-off mode we were talking about works when you set the unit at the Easy Mode—handy enough for first time flyers. Then you can go up to the Drift Mode which turns off the horizontal stabilization, so you’ll have to have some more skill to guide the drone properly. Finally, for seasoned flyers, there is the Racing Mode where, in the absence of any stabilization assistance, everything comes down to manual control. You will need to download and install the Parrot FreeFlight Mini app to your smartphone. This will let you handle the drone with the help of your phone. The app comes with loads of features and a user-friendly interface and you’ll especially appreciate the live feed share features which let you share your footage live on Facebook and YouTube. According to the manufacture’s claims, the Parrot Mambo FPV is the only minidrone in the market that packs this feature. • Interchangeable parts. You can buy damaged parts separately from the manufacturer. • Ease of use with fast turning, great altitude hold and so on. 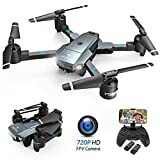 • Superior video capture quality from a drone of this price range. • Uses Bluetooth when camera is not attached to the copter. • Some users have found it difficult to connect the headset with available wifi networks. • Many users have also experienced video lag with the unit.